Oughtred Society Slide Rule History. In the 16th Century, engineering design as we know it today, with its emphasis on precise measurements and finely calculated tolerances, is unthinkable. And yet, every scientist, mathematician and alchemist feels that there are basic fundamental mathematical relationships that underpin the natural world. The pre-eminent figures in science both contribute to the creation of the slide rule and make use of it in their work, including Galileo, Napier, Gunter, Oughtred, Newton, Gauss, Watt, Priestley, Fulton, Fuller, Einstein, Fermi, and Von Braun. A quick look at the first five of these men covers the creation and initial evolution of the slide rule. Galileo Galilei popularizes the sector at the very end of the 16th Century. The sector is a graduated ruler that uses trigonometric formulae and a caliper to calculate squares, cubes, reciprocals and tangents of numbers. Galileo's design of the sector as a mathematical tool can be seen as the moment when calculation aids cease to be based upon counting and instead exploit the deeper relationships among numbers. His invention is still in use as a navigation aid in the 20th century … 300 years later. John Napier dramatically advances the understanding of number relationships in 1614 with his invention of logarithms. Since logarithms are the foundation on which the slide rule is built, its history rightly begins with him. His early concept of simplifying mathematical calculations through logarithms makes possible the slide rule as we know it today. Napier himself contributes Napier's Bones in 1617, calculating sticks based on the gelosia, or lattice, multiplication method. 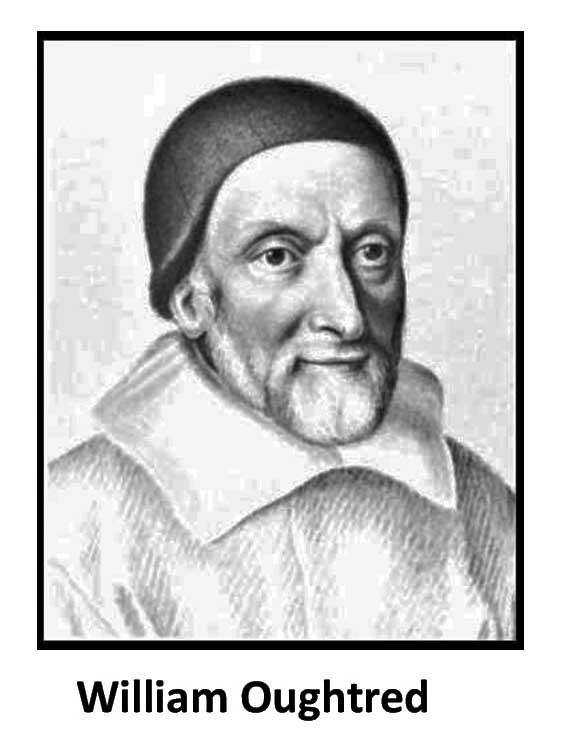 In 1620 Edmund Gunter of London makes a straight logarithmic scale and performs multiplication and division on it with the use of a set of dividers, or calipers. 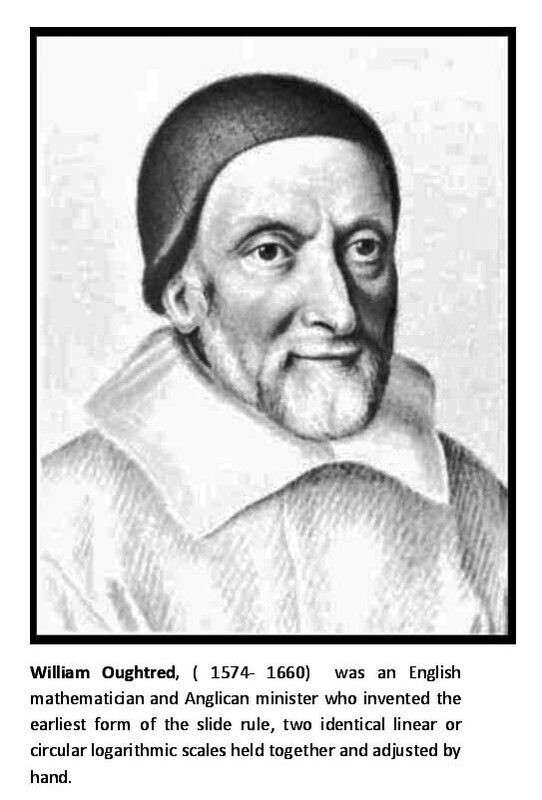 In about 1622 William Oughtred, an Anglican minister … today recognized as the inventor of the slide rule … places two such scales side by side and slides them to read the distance relationships, thus multiplying and dividing directly. He also develops a circular slide rule. In 1675 Sir Isaac Newton solves cubic equations using three parallel logarithmic scales and makes the first suggestion toward the use of the cursor. In 1677, two years after Newton invents the cursor, Henry Coggeshall perfects the timber and carpenter's rule. Newton's cursor fails to catch on at the time. The Coggeshall rule remains in common use 200 years later. His design and its standardization move the slide rule from a tool of mathematical inquiry to specialized applications. Beginning in 1683, Thomas Everard popularizes the gauging rule, used to determine the content of ale, wine and spirits barrels and to calculate the excise tax thereon. This design, first created by William Oughtred in 1633, sees widespread use well into the 19th century. In 1722 John Warner, a London instrument dealer, uses square and cube scales. By 1790 James Boulton and James Watt are modifying slide rules to improve their accuracy and usefulness. By 1799 their Soho slide rule helps to usher in the Industrial Revolution. It facilitates the design and manufacture of their seminal machine, the steam engine. In 1815 Peter Roget, an English physician (and the author of Roget's Thesaurus), invents a log log scale, which he uses to calculate roots and powers to any number or fraction thereof. It is regarded at the time as a mathematical curiosity. Fifty years later, advances in electrical engineering, thermodynamics, dynamics and statics, and industrial chemistry make these scales so necessary they are rediscovered. In the next fifty years they increase from three, to six, to eight scales on the slide rule, as engineering extends its grip on modern computation. In 1851 a French artillery officer named Amedee Mannheim standardizes a set of four scales for the most common calculation problems. The four scales include two double length, named A & B, for squares and square roots … and two single length, C & D, for multiplication and division. This scale set becomes the basis of slide rule design for the next 100 years and bears his name today. His design and use of a cursor hastens the eventual widespread acceptance of this feature. Early in the 19th century the first slide rules come into use in the United States. Ex- president Thomas Jefferson has one, and Joseph Priestley recognizes their advantages in his chemistry work, which includes the discovery of oxygen. By 1870, Germany produces two giants of the slide rule world, Dennert and Pape (makers of Aristo), and Faber (later Faber-Castell). The Dennert and Pape contributions of "engine divided" (engraved) scales and the stable deposit of celluloid on wood are revolutionary. The slide rule's importance to the Industrial Revolution, and the impact of the Industrial Revolution upon the slide rule, are demonstrated by the proliferation of designs. From 1625 to 1800, the first 175 years after its invention, a total of 40 slide rule types, including circular and spiral designs, are recorded. The next 100 years, from 1800 to 1899, sees the creation of 250 slide rule types and manufacturers. Over 90 designs are recorded in the first 10 years of the 20th Century. Cylindrical calculators with extra long logarithmic scales are invented by George Fuller of Ireland in 1878 and Edwin Thacher of New York in 1881. Production of Thacher's calculator is soon taken over by a Hoboken, New Jersey instruments company, Keuffel and Esser, which had previously imported slide rules for sale. A revolutionary linear slide rule construction with scales on both front and back and with a cursor referring to all scales simultaneously is patented in 1891 by William Cox … an invention he calls the "duplex slide rule". It is sold by K&E. Folded scales CF, DF and CIF are put on slide rules about 1900 to reduce the amount of movement and resetting of the slide. Log log scales in three sections appear about 1901, enabling very accurate calculation of powers and roots to any number or fraction. Our last century could not have been built without the slide rule, yet its direct evidence is almost totally missing to the uninformed eye. In the United States, this indispensability is seized upon most successfully by Keuffel and Esser. This firm moves from importing rules in the 1870s, to building a complex calculating instrument (the Thacher Calculator) in the 1880s, to manufacturing their own slide rules in the 1890s. Their contributions are legion, including the CI scale, their fanatical devotion to precision, their use of colored scales and slanting italics to aid in reading direction. A different path to market dominance is adopted in Japan by Jiro Hemmi. Hemmi systematically experiments with both natural base materials and celluloid, settling upon bamboo as the core, and combining this with very modern manufacturing (including celluloid surface lamination), resulting in both high quality and quantity. In the 1960's Hemmi is producing one million slide rules annually. The philosophy of engineering moves on. And the triumphs of 20th Century design become limitations for the slide rule. Einstein favors a Nestler slide rule in his work. 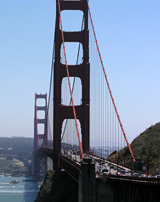 The approaches to the Golden Gate Bridge and the thrust profile of the Redstone Rocket are designed with simple Rietz based slide rules … E. H. Lowry's Dietzgen Phillips 1725 and Wernher Von Braun's Nestler 23 respectively. 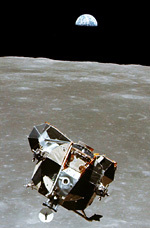 Pickett slide rules provide emergency computational power aboard Apollo missions with their N600-ES model. The Pickett N3 and N4 take their places along with the K&E Decilon and the Post Versalog in designing the F16 fighter airplane. But structural design and first principles in physics both seek answers to how structures will react to changing loads and forces. Wind speeds, tidal friction and interstellar collision all require dynamic computational models, rather than the answer to a static structural problem. Large, slow, obese computing engines designed for these questions give birth to the sleek four-function calculator. 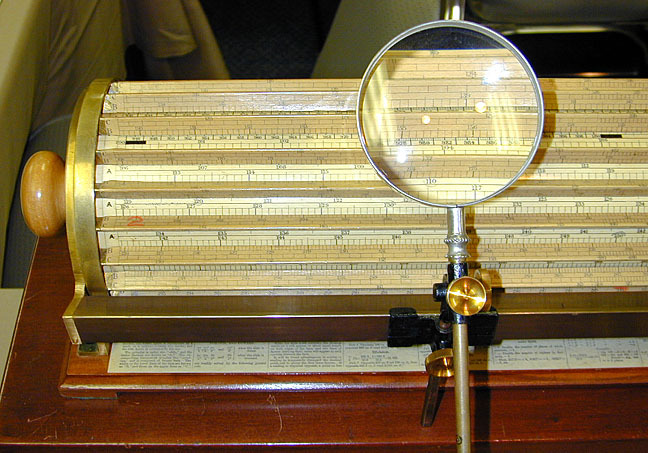 K&E's travails with its Analon slide rule model are an excellent example of the change in engineering demands that surpassed the slide rule. The four function electronic calculator is a symptom as much as a cause of this change. Slide rule researchers have estimated that possibly 40 million slide rules were produced in the world in the 20th century alone. Among these are many types of specialty slide rules developed and made for specific applications such as chemistry, surveying, electricity and electronics, artillery ranging, hydraulics, steam and internal combustion engines, concrete and steel structures, radio and other special fields. The slide rule has a long and distinguished ancestry … from William Oughtred in 1622 to the Apollo missions to the moon ... a span of three and a half centuries … it was used to perform design calculations for virtually all the major structures built on this earth during that long period of our history … an amazing legacy for something so mechanically simple.